It looks good. The chair you made for your mom is super nice, have you done ​​it yourself? Your chair is beautiful. I love your snails :))) Your sheep are so cute. 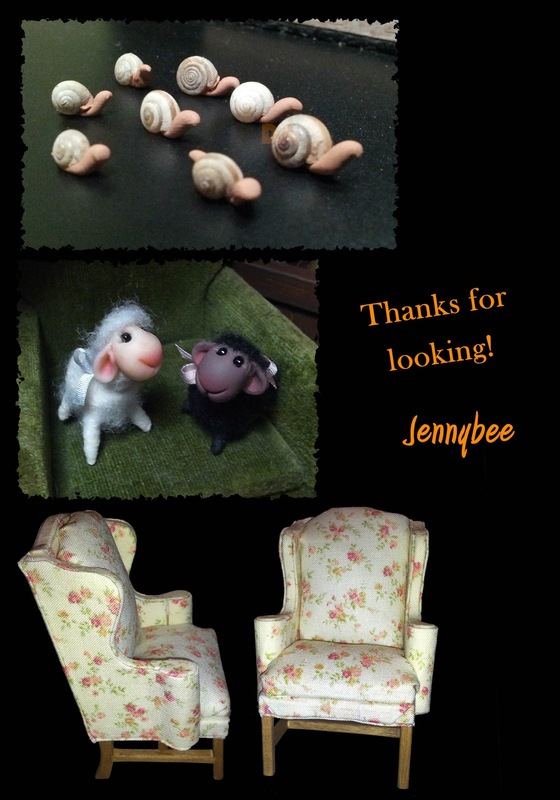 Thanks Jennifer, the snails were soo small I was surprised I didn't bend them or break them. Thanks Wyrna, yes I did make the chair, it was from a Chippendale kit. I was lucky enough a few years ago and got a variety of kits. I have now made 2 of those chairs. The other one was the 3 legged one I made a while back for my 3 story house. Thanks Jane, ya know come to think of it they would probably look good in your spring room. /wink! Thank Maria, I think they all are too, now to find a nice little place for the sheep to call home, I'm thinking maybe a vignette with lush green grass.